Disclaimer: I am not an accountant. Please check out these resources for doing your taxes, contact an accountant, or look on the IRS website for more information. I've been using Greenback Tax Services since 2011. You can read my review of them here and I have also reviewed Taxes for Expats. There's a programme in effect for people who have lived outside of the USA since 2009 and haven't filed. It's in place for taxes as well as the FBAR (TDF 90-22.1) (now FinCen Report 114). Basic Overview of US Expatriate Tax Requirements: by I.J. Zemelman, EA. Tax Operations Director at Taxes for Expats. What if I can't afford to pay my US taxes? : by I.J. Zemelman, EA. Tax Operations Director at Taxes for Expats. State Taxes . . . Check Greenback Tax Services and Taxes for Expats to see if you have to file state taxes. Here's an example for Illinois. 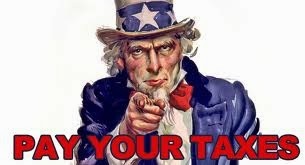 Federal taxes: You have to file if you're. . . If you make more than a certain amount you will have to file taxes. Here are the IRS guidelines. The IRS has a list of free programmes to help you such as free file. They also have a link and learn section. People living abroad are granted a two month extension if they file the 2350. This is only an extension to file if you owe taxes you still have to pay by April 15th. According to this Yahoo article the IRS targets certain taxpayers. International School Review also has an article on US taxes. You could always give up US citizenship just be aware that you may still have to file taxes. Check with the IRS's expatriation tax. In addition, if you will owe more than $1000 in self-employment taxes you will have to make quarterly estimated tax payments. Greenback Tax Services has useful info. This article covers the 2555, the 1116, Schedule SE for Self Employment, and Social Security. Here's a basic list of what you can and can't deduct. The IRS has a list of places that will help you file for free. Need a reason to file? How about student loan forgiveness? Check out what IBR Forgiveness for more info. There are basically two legal ways to get out of US taxes if you're an expat. The 2555 / 2555EZ (Foreign Income Exclusion) and the 1116 (Foreign Tax Credit). If you file the 1116 you can contribute to a ROTH IRA and if you have kids you might be able to get a refund as well. H and R Block gives a quick rundown of the differences. Expat Pro Tax: $289 flat fee. Expatriate Tax Returns: $300 flat fee. Greenback Tax Services: Read my review. Hillary CPA group: Worked in Europe and can give referrals to other accountants. Koam: Outside Osan main gate. 031-668-3235 or 010-3235-1235. Overseas Tax Services: They haven't accepted new clients in years. Seung Kang CPA: Located in Korea. Tax Barron: This man got back to me quickly, seems professional and has decent fees. Taxes for Expats: A blog and a tax quiz. Read my reivew. Tax Uncomplicated Their Facebook group. Very affordable. Read my review. US Income Tax for Expatriates and his blog. Married or Thinking About It? If you're married to a foreigner and aren't sure if you should file as married filing separately, married, or head of household, look at how your foreign spouse can save you US taxes. MSN Money has an article titled 7 tax reasons not to get married. If you're married to a non-resident alien, paid more than half the cost of the home and upkeep and had a dependent other than your spouse / or one of your parents living with you for at least half the year you might be able to claim Head of Household status. The IRS has more info. The Gift Tax You're allowed to get up to $13,000 per person without being taxed. There's no limit to how many people can give you money. So your friend can give you $13,000, your sister can give you $13,000, etc. As long as it's under $13,000 per person, it's ok. See TurboTax or the IRS for more info. You're allowed to give up to $13,000 per person (for Americans and US residents) and $134,000 to a foreign spouse each year without declaring it. However, if you give one person $15,000, both you and the person you give it to have to declare it since it's over $13,000. There are exceptions: no limit on spouses that are US citizens, tuition, medical expenses, and political organisations. The IRS has more info. Form TD F 90-22.1 FBAR(now FinCen Report 114). More than $10,000 in foreign bank accounts. Workbook. (See Appendix 1). Form 1116: Foreign Tax Credit (FTC). Instructions, topic 856, and RPIFS's explanation. (See Appendix 2). Form 2555: Foreign Earned Income Exclusion (FEIE). Instructions, 5 FEIE facts, and RPIFS's explanation. (See Appendix 3). Form 2555EZ: Foreign Earned Income Exclusion EZ (FEIE). Instructions. (See Appendix 3). Form 6251: Alternative Minimum Tax (AMT). AMT Assistant and instructions. (See instructions for line 33) (See Appendix 4). Form 8802: Proof of the U.S. as a tax home so you don't have to pay foreign taxes. Instructions. (See Appendix 5). If you're making a bit of extra cash teaching private lessons or making money online you might be tempted to not declare your earners. Don't go that route: it's illegal. If you declare your self employment income then you have taxable income and can contribute to IRAs. In addition, you can contribute up to 25% of your self employment salary up to a limit to an SEP IRA. By declaring self employment income you can contribute to a Roth IRA, a regular IRA, and an SEP IRA. Here's a bit more info on SEP IRAs. You can either pay the country you're living in or the U. S. You may have to pay quarterly, see Greenback Tax Service for more info. For example, if you teach in China and have private classes and you're not paying taxes on that income in China you have to pay in the US. (If you were to pay taxes in China on the private classes, then you'd file 6166 to show that you had already paid taxes). You're allowed to make $400 a year for self-employment income then you have to pay taxes. See Chance Favors article, the IRS website, and the US embassy for more info. Paying taxes to a foreign country: you'll have to file 6166 and the regular 2555. Paying taxes to the US: you'll have to file Schedule SE, Schedule C, and the regular 2555. U.S. Self-Employment tax is both the employer's and the employee’s share of Social Security and Medicare taxes. The Schedule SE's tax rate is 15.3% of net Schedule C income before any foreign income exclusion. The taxable net self-employment rate is not reduced by the 2555. Net earnings is what you have after all legal business expenses are deducted and include the income earned in a foreign country and the US. The IRS has a guide for property. Schedule E: Rental property income. Instructions, publication 527, and the adjusted cost basis. File if you have a TOTAL of $10,000 or more in any foreign bank account(s) at any time during the year. So if you have $5000 in one and $6000 in another, you have to file since your total is $11,000). The IRS has the Foreign Account Tax Compliance Act (FATCA) and more countries are signing agreements with the US. The NY Times has an article about 5 European nations that have just signed agreements to give tax info to the US making it harder for Americans to dodge the FBAR. Greenback Tax Services has more information on the FBAR. The 1116 might work better for you if you have don't fulfill the requirements for the 2555. It allows you to count passive income as well. It might work more in your favour if you have kids. Topic 856 at the IRS discusses the Foreign Tax Credit. Another benefit is that you don't have to itemize all the perks your employer gives you like you do in the 2555. You have to file a separate 1116 for EACH income, ex: salaries go on one 1116, rental income on another 1116, etc. Greenback Tax Services has more information on Form 1116. You probably won't have to pay Uncle Sam (unless you have other income like dividends, interest, property, another business, etc), if you file the 2555 or 2555EZ. If you're married to a foreigner, and claim your spouse as a dependent, you will need to get your spouse an ITIN number. It might be easier to just file as "married filing separately" but you'll have to run the numbers and figure things out. For 2010 you can make up to $91,500 without paying taxes. However, not all of your income counts towards this limit. If you have any self-employment income over $400 for the year you MUST pay 15.3% tax. You will also have to pay tax on any profit you make from selling a house, car, or land. If you have this type of income, you'll have to file the 2555, not the 2555EZ. If you are given housing, a housing allowance, moving allowance, education allowance, or any other allowances or benefits other than your salary, then you will probably have to file the 2555. If you pay a lot for housing, you might want to look into the foreign housing exclusion, which is only on the 2555. Check publication 54 for more info. If you have any self-employment income over $400 you will have to file the 2555. If you are not a tax resident in the country where you reside (ie. You made a statement to the government saying that you weren't a resident so that you don't have to pay taxes. For example, if you filed the 8802 and got the 6166), then you have to file the 2555. Korea does this and Americans who work at public schools or universities (not hagwons) don't have to pay Korean taxes for up to 2 years. This allows you to not pay Korean or American taxes. The US embassy in Korea has more information about this. Should You File the 2555 or the 2555EZ? You can file the 2555EZ if you pass the 7 questions at the top of the form and fulfill one of these. Bona Fide Resident: You were a bona fide resident in a foreign country and your tax home is outside of the US. Physical Presence: You've been away from the U.S. for 330 days in the past year and your tax home is outside of the US. You can file the 2555 if you fulfill one of these. Physical Presence: You've been away from the U.S. for 330 days in the past year. What's a Bona Fide Resident? It's very subjective. This doesn’t mean that you have to have residency in the foreign country but that you have set up residency. Examples of this are getting a license, purchasing property, opening a bank account, etc. A bona fide resident means that you go to a foreign country with the idea of making it your home and staying indefinitely. If you are only going for a bit and intend to go back to the US then you are not a bona fide resident. You will have to file the 2555 and not the 2555EZ if you get cash or non cash benefits. There are many different benefits, such as, but not limited to the ones below. Basically anything you receive in addition to your salary needs to be declared. Find out whether you need to pay or not by filling out the IRS's handy AMT assistant. Proof of the U.S. as a tax home. For example, in Korea to get out of Korean taxes for 2 years. You will be issued with Form 6166.